Context Elderly patients are at high risk of both abnormal hematocrit values and cardiovascular complications of noncardiac surgery. Despite nearly universal screening of patients for abnormal preoperative hematocrit levels, limited evidence demonstrates the adverse effects of preoperative anemia or polycythemia. Objective To evaluate the prevalence of preoperative anemia and polycythemia and their effects on 30-day postoperative outcomes in elderly veterans undergoing major noncardiac surgery. Design Retrospective cohort study using the VA National Surgical Quality Improvement Program database. Based on preoperative hematocrit levels, we stratified patients into standard categories of anemia (hematocrit <39.0%), normal hematocrit (39.0%-53.9%), and polycythemia (hematocrit ≥54%). We then estimated increases in 30-day postoperative cardiac event and mortality risks in relation to each hematocrit point deviation from the normal category. Setting and Patients A total of 310 311 veterans aged 65 years or older who underwent major noncardiac surgery between 1997 and 2004 in 132 Veterans' Affairs medical centers across the United States. Main Outcome Measures The primary outcome measure was 30-day postoperative mortality; a secondary outcome measure was composite 30-day postoperative mortality or cardiac events (cardiac arrest or Q-wave myocardial infarction). Results Thirty-day mortality and cardiac event rates increased monotonically, with either positive or negative deviations from normal hematocrit levels. We found a 1.6% (95% confidence interval, 1.1%-2.2%) increase in 30-day postoperative mortality associated with every percentage-point increase or decrease in the hematocrit value from the normal range. Additional analyses suggest that the adjusted risk of 30-day postoperative mortality and cardiac morbidity begins to rise when hematocrit levels decrease to less than 39% or exceed 51%. Conclusions Even mild degrees of preoperative anemia or polycythemia were associated with an increased risk of 30-day postoperative mortality and cardiac events in older, mostly male veterans undergoing major noncardiac surgery. Future studies should determine whether these findings are reproducible in other populations and if preoperative management of anemia or polycythemia decreases the risk of postoperative mortality. Little is known about the effects of polycythemia in the operative setting.11-13 Although high hematocrit values have been related to an increased risk of atherosclerosis and development of cardiovascular disease,14-17 most reports have differed on the hematocrit cutoff at which this could be harmful. 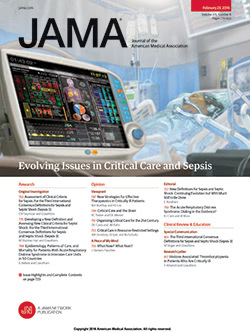 These investigations have typically described long-term outcomes rather than short-term mortality risk.16,17 The purpose of the current study is to evaluate the prevalence of preoperative anemia and polycythemia and their effects on 30-day postoperative outcomes in a national cohort of older veterans undergoing major noncardiac surgery. We conducted a retrospective cohort study using data from the National Surgical Quality Improvement Program (NSQIP). The NSQIP is a Veterans Health Administration (VHA)–wide initiative designed to improve the quality of surgical care through prospective collection of clinical data on major surgeries (defined as procedures performed in the operating room requiring general, spinal, or epidural anesthesia) and the reporting of comparative risk-adjusted postoperative outcomes.7,18 It contains data from 132 VHA hospitals nationwide and has been described in detail elsewhere.19 It excludes surgeries with very low mortality rates (eg, ophthalmologic, auditory, or nasal procedures). The Box lists in descending order the most frequent operations undertaken in our study. To assess the potential influence of race/ethnicity on postoperative outcomes, this information was abstracted from the electronic medical records and classified into white or nonwhite in the study. The reliability of the abstracted data has been validated, with more than 96% in the interobserver agreement.20 Data were more than 99% complete, with the exception of certain laboratory variables, such as serum albumin (39% missing) and blood urea nitrogen (6% missing). These missing data were imputed using a validated multiple imputation method.7,21-23 Sensitivity analyses were conducted in our study with and without the adjustment for imputed variables in the model and found similar results. To obtain data on coronary disease–related variables, we merged the NSQIP data with the VHA administrative Patient Treatment File for hospitalization records and the Outpatient Care File for ambulatory records. These variables included hospitalization for angina within 30 days before the operation, myocardial infarction within 6 months of the operation, and performance of coronary artery bypass graft surgery and percutaneous coronary intervention within 2 years of the operation. The study was approved by the Providence VA Medical Center Institutional Review Board, Providence, RI. Our units of analyses were major noncardiac surgeries performed on veterans aged 65 years or older identified from the NSQIP data set during 1997-2004. Of the 326 124 surgery cases identified, we excluded 15 813 cases who met 1 or more of the following exclusion criteria: lack of preoperative hematocrit measurement, repeat operations within 30 days of the index surgery, and surgeries without a Current Procedural Terminology code assigned. The 30-day mortality rate of the excluded cases (3.87%) is comparable with the 30-day mortality rate of the study sample (3.89%). Preoperative hematocrit value was defined as the last hematocrit measurement prior to the index operation. Ninety-nine percent of the hematocrit values were obtained within 3 months of the index surgery (79% were obtained within 4 weeks). Based on conventional literature, we defined preoperative anemia as a hematocrit value of 39.0% or less,24 polycythemia as a hematocrit value of 54.0% or greater,25 and normal hematocrit as a value between 39.0% and 53.9%. Since conventional definitions of anemia and polycythemia may not necessarily translate into an increased risk of postoperative 30-day mortality, we first divided the study sample into groups based on their preoperative hematocrit values to detect the threshold at which increase in fatal postoperative outcomes occur and to facilitate outcome comparisons with previous studies.4,5 This resulted in 14 groups with preoperative hematocrit values of less than 18.0%, 18.0% to 20.9%, 21.0% to 23.9%, 24.0% to 26.9%, 27.0% to 29.9%, 30.0% to 32.9%, 33.0% to 35.9%, 36.0% to 38.9%, 39.0% to 41.9%, 42.0% to 44.9%, 45.0% to 47.9%, 48.0% to 50.9%, 51.0% to 53.9%, and 54.0% or more. The primary study outcome measure was death within 30 days of the index surgery. Our secondary outcome measure was a composite end point of death or cardiac events (cardiac arrest or Q-wave myocardial infarction) within 30 days of the index surgery. Q-wave myocardial infarction was defined as new pathologic Q-waves on the postoperative electrocardiogram accompanied by symptoms or abnormally high levels of cardiac enzymes (creatine kinase and/or troponin). Non-Q wave myocardial infarctions were not considered since perioperative measurement of troponin values was not universal during the study period. We compared demographic and clinical characteristics among patients with anemia, normal hematocrit levels, and polycythemia. Differences between the groups were tested with χ2 analyses for categorical variables and analysis of variance for continuous variables. Evaluation of the Conventional Definitions. We first determined the 30-day postoperative mortality rates associated with each of the 14 prespecified preoperative hematocrit categories. We then estimated the independent predictive value of each hematocrit category for primary and secondary study outcomes compared with the hematocrit category with the best 30-day postoperative survival. Analyses were adjusted for potential confounding by logistic regression modeling, incorporating NSQIP variables and prior coronary disease predictors of 30-day outcome (Table 1). Because we observed that the increase in the rates of 30-day mortality for patients with anemia was fairly linear and similar to the increase in mortality observed in patients with polycythemia, we characterized this relationship in a “hematocrit deviation from normal range” variable to facilitate clinical use. Therefore, patients' preoperative hematocrit values within the “normal range” (39.0%-53.9%) were coded as 0, those with values above the normal range were coded as the actual value minus 53.9%, and those with values below the normal range were coded as 39.0% minus the actual value; and their association with 30-day mortality was examined. Logistic regression modeling was used to adjust for potential confounding incorporating the predictors of 30-day mortality listed in Table 1. Subgroup Analyses. We applied similar logistic regression models to evaluate a priori–defined subgroups of patients who underwent procedures from surgical subspecialties with higher case frequency and mortality (orthopedics, general, peripheral vascular, and thoracic surgeries) and of patients with particular clinical profiles (prior coronary disease, severe renal insufficiency, chronic obstructive pulmonary disease (COPD), women, age >75 years, and emergency cases). A list of the most frequent operations by surgical subspecialty (defined by the subspecialty of the surgeon) is available from the authors. Prior coronary disease was defined by the presence of any coronary disease variable shown in Table 2. Severe renal insufficiency was defined by use of dialysis or a preoperative serum creatinine level of 2.5 mg/dL (221 μmol/L) or higher (which corresponds to the presence of severe kidney disease in an average-weight individual aged >65 years). All reported P values were 2-sided and a P value of .05 was considered to be significant. SAS software, version 9.1.3 (SAS Institute Inc, Cary, NC) was used for the statistical analyses. A total of 310 311 surgical cases met the study inclusion criteria. Based on conventional definitions, 42.8% of our study cohort had preoperative anemia, 0.2% had polycythemia, and the remaining 56.9% had normal preoperative hematocrit values (Table 2). The cohort with anemia had the most female and nonwhite patients and the highest prevalence of diabetes, cardiac disease, neurologic disorders, renal disease, long-term steroid use, infected surgical wounds, weight loss, cancer, and preoperative blood transfusions compared with the nonanemic cohorts (P<.001). Additionally, they had a tendency to be older, inpatients, at a higher American Society of Anesthesiologists class (indicating more severe systemic disease), and nonindependent in functional status (P<.001). They were also more likely to have a do-not-resuscitate order and to undergo vascular, orthopedic, or plastic surgery (P<.001). Patients with polycythemia were more likely to be smokers, to consume more than 2 drinks of alcohol per day, to have general anesthesia, and to undergo general, otolaryngologic, or emergent surgery than patients without polycythemia (P<.001). They also tended to have ascites, dyspnea, COPD, bleeding disorders, high serum sodium values, low platelet counts, high white blood cell counts, and high serum aminotransferase values (P<.001). The crude 30-day postoperative mortality rate was 3.9% and the cardiac event rate was 1.8% for the entire study population. The hematocrit category of 45.0% to 47.9% had the best 30-day survival and was used as the reference category for outcome comparisons among the 14 categories. Both mortality and cardiac event rates rose monotonically for patients with progressively lower or higher hematocrit values than the reference category, with higher rates at both extremes of the hematocrit spectrum (Table 3). The hematocrit category of less than 18% had the highest crude 30-day postoperative mortality and cardiac event rates. After adjusting for potential confounding, each hematocrit category in the anemic and polycythemic ranges had significantly worse outcomes for 30-day mortality and the composite of mortality and cardiac events, except for the hematocrit category of 21.0% to 23.9%. The hematocrit category of 51.0% to 53.9%, while not meeting the conventional definition for polycythemia, also showed an increased risk of 30-day postoperative mortality. When we analyzed the outcomes associated with the conventional definition of anemia and polycythemia using the “hematocrit deviation from normal range” variable, we found a 1.6% (95% confidence interval, 1.1%-2.2%) increase in the adjusted risk of 30-day postoperative mortality for every percentage point of hematocrit deviation from the normal range (39.0%-53.9%). Thus, a patient with a preoperative hematocrit value of 30.0% has a 14.4% increased risk of 30-day postoperative mortality, while a patient with a preoperative hematocrit of 24.0% has a 24.0% increase in the risk of 30-day postoperative mortality. The increase in the 30-day mortality risk associated with each percentage point of hematocrit deviation from the normal range in the subgroups defined by surgical subspecialties and clinical profiles is shown in Table 4. Among the different subspecialties, the mortality increase per percentage point of deviation from the normal range was 3.1% in patients who underwent orthopedic surgery, 1.4% in thoracic surgery, 0.8% in general surgery, and 0.4% in peripheral vascular surgery. Among the different clinical cohorts, the mortality risk increase per percentage point of hematocrit deviation from the normal range was 1.9% for patients aged 75 years or older, 1.7% for those with COPD, 1.0% for those with renal disease, 0.4% for those with any coronary disease, and 0.1% for emergency surgeries. Hematocrit deviation from the normal range did not increase 30-day mortality risk in women. The effects of low or high hematocrit values in the elderly population undergoing major noncardiac surgery are not well understood. Previous studies have shown a remarkable physiologic tolerance toward anemia in healthy adults26 through an increase in cardiac output and oxygen extraction ratio and a decrease in vascular resistance.27,28 However, our results suggest that in elderly patients, even minimal degrees of anemia or polycythemia are associated with a significant increase in the risk of 30-day postoperative mortality and cardiac events. Despite small variations, the increase in 30-day mortality risk was observed in the majority of the subgroups examined. The exceptions were in the female population and in patients undergoing emergent surgery. Women are well-known to have different cutoffs for a normal hematocrit range than men.25 While our findings are supportive of this knowledge, it is also possible that our limited sample size of women failed to detect a significant relationship between hematocrit and postoperative mortality. Given this, our findings may not be generalizable to the elderly female population. Patients who underwent emergent surgery were another group of patients in whom we found almost no relationship between preoperative hematocrit and mortality. This may be explained by 2 factors. First, the severity of the underlying disease causing the emergency could have been so overwhelming that the effect of hematocrit on mortality was overshadowed. Second, the documented preoperative hematocrit value might not reflect the actual value at the time of the emergency surgery and, therefore, could not be accurately related to outcomes. Previous studies have found preoperative anemia to be an adverse risk predictor only in patients undergoing vascular or extensive surgeries and in those with major blood loss or cardiac diseases.5,29,30 However, we have found that the increased risk of postoperative events occurs with any degree of anemia, independent of the type of surgery. This discrepancy could be related to a larger sample size in our study to detect small differences in outcomes and our focus on an elderly population. Several factors relate aging and anemia as a risk factor for operative mortality. First, cardiac reserve is diminished in elderly persons,8 which may restrict regular physiologic compensation for anemia.9 Second, the high prevalence of subclinical coronary disease in elderly persons potentially decreases tolerance of anemia,10,31 as coronary vasodilation is not possible in the presence of significant stenoses and the cardiac oxygen extraction ratio may be limited.32,33 Our observations support these assumptions, as postoperative cardiac event rates were closely linked with anemia. Our findings also speak to the applicability of the World Health Organization's definition of anemia in the elderly population24 and may have important clinical implications. Current national guidelines for perioperative management of anemia recommend treatment only when hematocrit values of less than 18% are present.34,35 Guidelines note a lack of evidence to treat mild or intermediate degrees of anemia in the operative setting. This study provides evidence in a large sample of mostly male patients aged 65 years or older that the increase in the risk of cardiac events and death is proportional to the degree of anemia and begins at hematocrit values of less than 39%. In fact, the majority of deaths can be attributable to only modest degrees of anemia (hematocrit levels of 27.0%-38.9%). The most common sources of anemia in elderly persons are related to iron deficiency and chronic diseases and are likely the causes of anemia in our population as well, given their comorbidity profiles.1,36 The treatment of anemia in the preoperative setting with iron, erythropoietin, or red blood cell products and their substitutes34,37-39 is possible for most major elective surgeries. If anemia is a modifiable risk factor and not simply a marker of other conditions that confer increased risk, then preoperative transfusion might be considered.40 Further studies are needed to examine the utility of blood restoration strategies in the preoperative setting. Physiologically, polycythemia is related to increased blood volume, and hematocrit levels of 51% or greater approximate the level at which a steep increase in blood viscosity occurs.11,13 High blood volumes in conjunction with high blood viscosity result in increased cardiac afterload.27 High afterload decreases cardiac output, which may result in diminished perfusion to vital organs.42,43 In addition, higher blood viscosity is thrombogenic44 and has been associated with a higher incidence and extent of coronary disease and stroke.17,45 The effects of low cardiac output and high thrombogenicity are likely to be exacerbated during surgery,46 which may ultimately trigger acute cardiovascular events. The increase in the rate of cardiac events associated with high hematocrit values in our study supports these assumptions. Our study has several limitations. First, approximately 21% of the preoperative hematocrit values were obtained more than 4 weeks prior to surgery and may not accurately reflect the hematocrit levels at the time of surgery. However, variation of hematocrit values in an individual is likely to be small in the absence of an emergency operation or bleeding. Because we controlled for the effects of both in our statistical modeling, we believe that the small uncertainty introduced by the time lag between testing and surgery is commonly accepted on clinical grounds. Second, conclusions drawn from our patients with polycythemia may not be as robust as those drawn from those with anemia due to a much smaller sample size. Nonetheless, there are few reports that describe the postoperative risk of patients with polycythemia, and our results should shed light on the potential risk of this population. Third, given the observational nature of our study, we cannot determine the causal relationship between low or high hematocrit values and risk of postoperative adverse events. Neither can we relate the etiology and chronicity of the abnormal hematocrit value with outcomes. This is particularly important when considering the treatment of abnormal hematocrit values. If these changes are reflective of underlying conditions, then a low hematocrit value may be a marker of risk and not a modifiable risk factor. Our findings suggest that among older men undergoing elective surgery, the lowest risk of adverse outcomes was in those with preoperative hematocrit values between 39.0% and 50.9%. Even minimal deviations from this optimal range were associated with an increased risk of 30-day postoperative mortality and cardiac events. Future studies should determine if treatment of preoperative anemia and polycythemia improve the postoperative outcomes of this vulnerable population. Corresponding Author: Wen-Chih Wu, MD, 830 Chalkstone Ave, Providence, RI 02908 (Wen-Chih.Wu@va.gov). Author Contributions: Dr Wu, Ms Schifftner, and Dr Henderson had full access to all of the data in the study and take responsibility for the integrity of the data and the accuracy of the data analysis. Study concept and design: Wu, Schifftner, Henderson, Eaton, Poses, Uttley, Sharma, Vezeridis, Khuri, Friedmann. Acquisition of data: Schifftner, Henderson, Khuri. Analysis and interpretation of data: Wu, Schifftner, Henderson, Eaton, Poses, Uttley, Sharma, Vezeridis, Khuri, Friedmann. Drafting of the manuscript: Wu, Schifftner, Henderson, Eaton, Friedmann. Critical revision of the manuscript for important intellectual content: Wu, Schifftner, Henderson, Eaton, Poses, Uttley, Sharma, Vezeridis, Khuri, Friedmann. Obtained funding: Wu, Henderson, Khuri. Funding/Support: This work was supported by the VA Merit Review Award in Health Services Research and Development grant IIR 04-313. Support included research time and data access for Dr Wu, Ms Schifftner, and Dr Henderson and consultant fees for Drs Eaton and Poses. Role of the Sponsor: The database was provided by the VA NSQIP, who collected the data and reviewed and approved the manuscript prior to submission. Disclaimer: The views expressed in this article are those of the authors and do not necessarily reflect the position or policy of the Department of Veterans Affairs. Acknowledgment: We thank Vincent Mor, PhD, Department of Community Health, Brown University, who critically reviewed this article and provided useful comments.